Grupa Five Horse Johnson powstała w stanie Ohio w Toledo. W swoich muzycznych poszukiwaniach nawiązuje wyraźnie do korzeni bluesa, ale wszystko to w bardzo hard rockowej oprawie. Wydała kilka bardzo "mocnych" albumów, ale debiutancki "Blues For Henry" wydaje mi się najciekawszy i najbardziej "bluesowy". Bardzo mocna muzyka, świetny wokal czasem wpadający w manierę beefheartowską. No co tu dużo opowiadać - mięso! 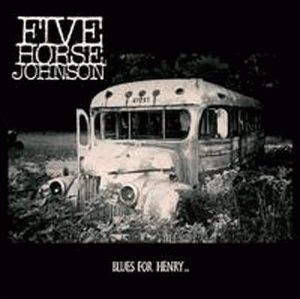 When Five Horse Johnson formed back in the year of 1995, and announced themselves as a Blues Band, their friends may have thought they had cause to worry. After all, it is a well-worn banality that white boys can only ever hope to mimic the blues, isnt it? The band has always understood that the Blues isnt a formula, but a way of looking at the world; their blues is a dirty, sensual thing (it aint for nothin that their new catalog number is 69, people! ), and while retaining a more than healthy dose of humor, they are completely and 100% free of the goofy hardy-har-har trappings of some of the other wannabes out there trying to be bluesy (hear that, J. Spencer?). Over the past decade, Five Horse Johnson has happily and thankfully proven the doubters wrong. Never apers, over the course of 6 albums, Five Horse Johnson has honed out a niche all their own, combining their love and respect for the Blues, Classic Rock and other, less dog-eared influences of their youth to become one of the most loved and respected bands in the Underground Rock community. Always a right freight train live, the band has spent a lot of time on the road with the likes of Clutch, Halfway To Gone, etc., gathering fans, friends, and drinking partners all over the world. Now, however, with The Mystery Spot, and with the help of their good friend and newest collaborator, Clutchs Jean Paul Gaster helming the drums, Five Horse Johnson has created their strongest album to date. The power is there in spades, and the influences are still clear ( wait, do I hear a bit of Captain Beefheart in there?). The Mystery Spot is a polished affair, but its like the polish on a muscle car: it doesnt slow the vehicle down one bit in fact, one may find that the car slips through the air even better, and it makes better use of its enormous engine J.P. Gaster and Steve Smith provide more power than a Super Hemi. Brad Coffins guitar has never sounded more lithe, his voice never stronger. Eric Oblanders harp is as sharp as a tailfin, his gravelly vocal delivery a growling, howling counterpoint to Coffins gruff style. Other collaborators on The Mystery Spot include Roadsaw/Antlers Craig Riggs and Big Chiefs Phil D and Mark Dancey all doing what they do best. The Mystery Spot is a powerhouse of a record, a focused affair that makes the listener want to reach for the bottle, the smokes and the volume knob all at the same time. All dexterity aside, we predict there will be a lot of ugly spillage especially when Five Horse Johnson goes back on the road to bring this baby to the people. We here at Small Stone suggest you dont bother cleaning up, go with the feeling, cause the feeling is good, goddammit!